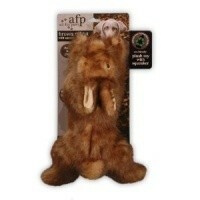 All For Paws Plush Rabbit Squeaker Large Dog Toy is a fantastic quality toy for your dog that has an amazingly realistic and life like appearance. Made from premium plush material, this natural looking toy will encourage the hunting instinct in your dog, bringing out the inner beast for a more enjoyable and fulfilling play time experience. With the added squeaker that provides additional interaction, this fabulous toy will keep you dog entertained for hours!